Visiting the dentist can daunt some people, but if you follow these five tips you should be able to be – “Ready! Get set! Go!” to your visit. Being ready helps you and your dentist make the most of your dental visits. Whether your visit is a checkup, a cleaning, or a treatment, there are a few things you should do. Confirm your appointment. Check with your dental office 24 hours in advance of your appointment. This avoids any mix-ups, and makes sure that you and your dentist will be ready for each other at the same time. Arrive on time. Actually, a few minutes early won’t hurt. This helps you be more relaxed and at ease and also give you more time to fill in any forms that might be needed. Mention if you have ‘nerves’. If you mention your concerns to your dentist, they will be able to help. Your dentist is trained to handle anxiety. Also, sometimes expressing our anxieties reduces them! Discuss dental problems with your dentist. By mentioning any dental concerns you’ve experienced, you give you dentist a heads-up on your condition. This helps your dentist determine appropriate treatments. Be sure to schedule follow-up appointments. By scheduling early you can pick a time that is most convenient for you and ask the dental office to send you a reminder. 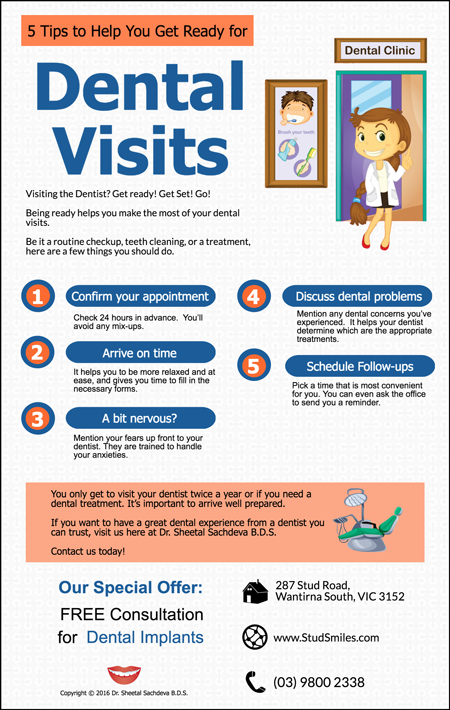 Normally, you only visit your dentist twice a year or if you need a dental treatment. So it is important to arrive well-prepared. In addition, if you are anxious about dental procedures, our sleep dentistry methods can help you overcome your fear and feel comfortable throughout the procedure. 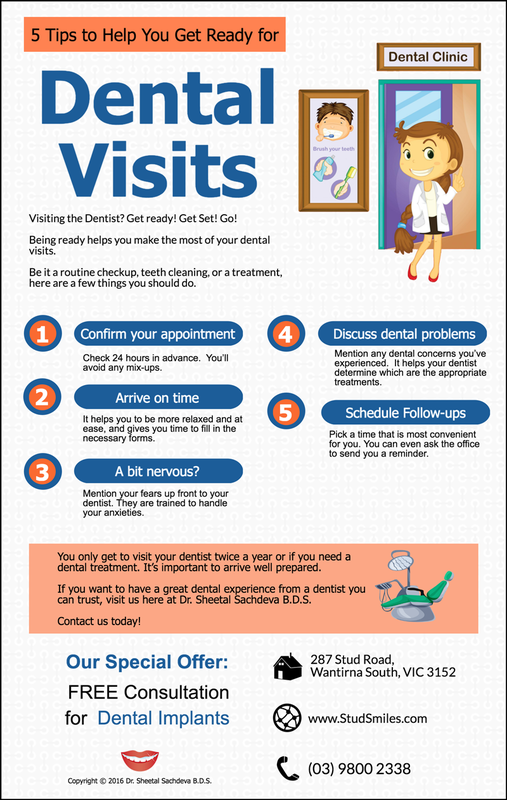 If you want a great dental experience from a dentist you can trust, visit us at Dr. Sheetal Sachdeva B.D.S. in Wantirna South.